Helps reduce the appearance of bruises. 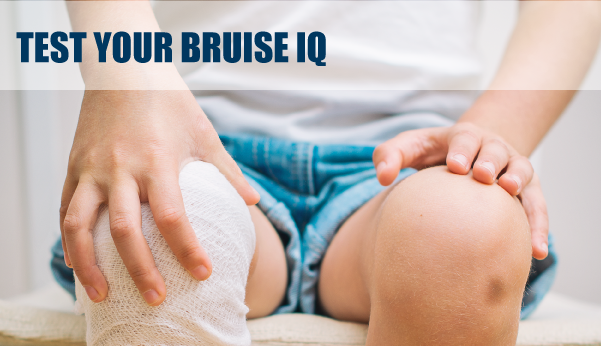 Test your knowledge on the science of why we bruise and common ways to treat bruising. Q1. TRUE/FALSE You become more susceptible to bruising as you age. Q2. TRUE/FALSE You get a bruise after you bump into something because some veins break under your skin. Q3. TRUE/FALSE Immediate application of heat is the best way to minimize a bruise. Q4. TRUE/FALSE Fish oil supplements decrease your risk of bruising. Q5. TRUE/FALSE Bruises turn bluish or purple immediately. Then, after 1-2 days they will appear a reddish color. Q6. TRUE/FALSE Bruises turn blue or purple because oxygen has been cut off from the area. Q7. TRUE/FALSE If your bruise really hurts, you should take aspirin. Q8. TRUE/FALSE The old “steak on a black eye” remedy is, in fact, the best treatment for a bruise. Q9. TRUE/FALSE It takes 2-3 weeks on average for the ugly colors of a bruise to clear up. Q10. TRUE/FALSE Ectopic bruising happens when the bruise appears somewhere other than the site of the impact. Q11. TRUE/FALSE Women bruise more easily than men do. Q12. TRUE/FALSE Bruises can be scored on a scale from zero to five, with critical level-5 bruises carrying the risk of death. Q13. TRUE/FALSE You could have a hernia if you have bruising around your belly button. Q14. TRUE/FALSE Regular doses of aspirin will probably cause your bruises to last longer. Q15. TRUE/FALSE If you bruise easily, it could be because you don’t have enough vitamin B12 or folic acid in your diet. Why do some people bruise easily? © 2019 BruiseCreme. All Rights Reserved.